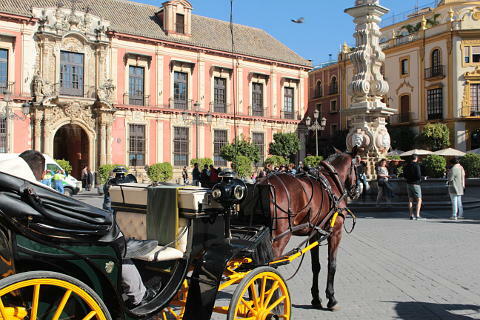 Seville is the capital of the Seville province in the Andalusia region of Spain. It is considered to be one of the 'Most Beautiful Cities in Spain'. 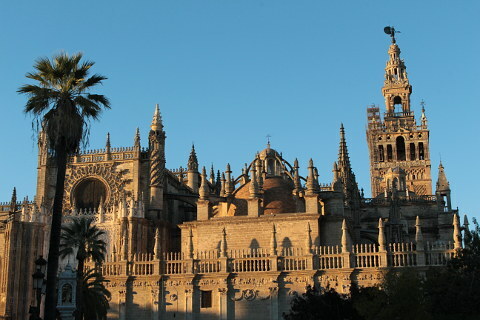 Seville is a beautiful city with some important monuments but more than this it is a city full of charm and vitality. It has three UNESCO World Heritage listed buildings in its historic centre. 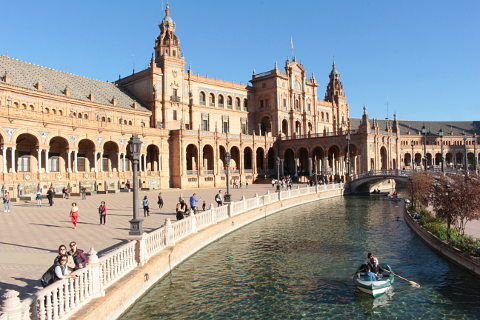 Seville is the capital of Southern Spain and not to be missed both for its beauty and its lively atmosphere. It has two excellent festivals which really are worth going to. One is Seville's Semana Santa festival. The Semana Santa takes place throughout Spain in the week before Easter. The other is the Feria de Abril which starts two weeks after easter and also lasts a week. A recent visit to Seville put it firmly on my list of favourite cities in Spain - especially if you are looking for a holiday outside of the hot sunny months. The lovely mix of Andelusian and Moorish architecture giving it a more exotic flavour than is usually the case when visiting Europe. Whilst Seville is the 4th largest city in Spain it has the atmosphere of a small city and if you take a hotel in or near the Santa Cruz or El Arenal districts you will find you can visit all the main sights on foot. A city-break of 3-4 days will allow you to see the main sights without rushing but will leave you wanting to come back for a longer trip to really savour the atmoshere. 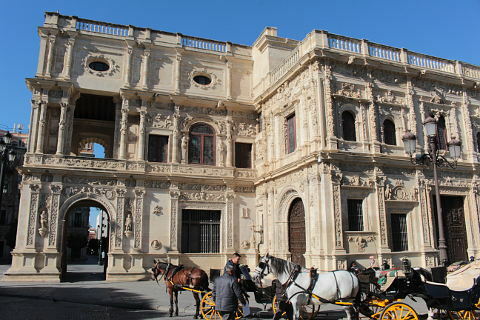 The old city contains the main historic sights of Seville. It lies on the east bank of the Rio Guadalquivir. 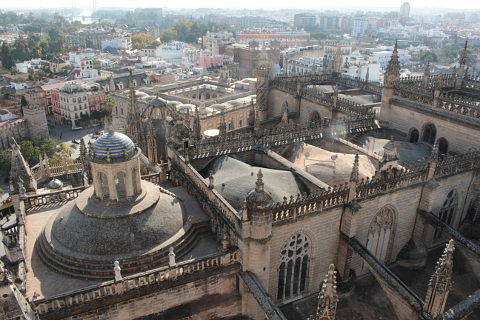 Right next to each other are Seville's three UNESCO listed buildings; the cathedral with its La Giralda tower, the Archivo de Indias and the Alcazar. Seville Cathedral stands on the site of a mosque built in the 12th century and the Giralda tower and the Patio de los Naranjos, attached to the cathedral still remain of this. The cathedral itself is one of the biggest in Europe and took a century to complete. Construction began in 1401 and it is an immense Gothic building. Inside the cathedral the Sacristia houses many works of art and there is also the tomb of Christopher Columbus. 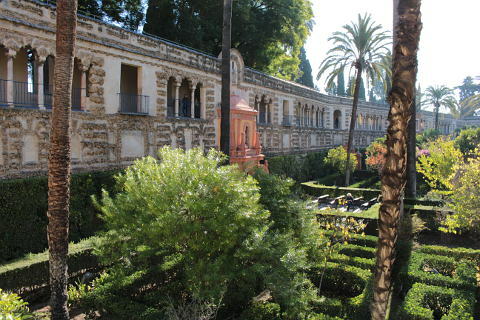 The Moorish part, the Patio de los Naranjos is a large patio planted with orange trees and contains a fountain where muslims would wash their feet before entering the mosque. 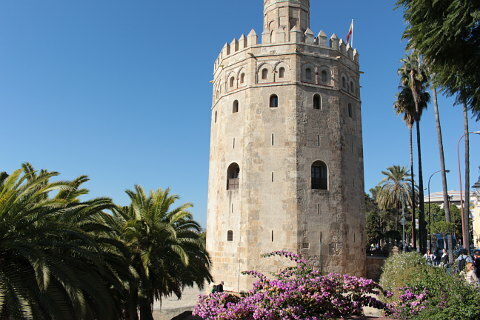 The tower of La Giralda was originally a minaret and was built in 1198. It is now taller than it originally was as an ornate belfry was built onto the top in 1568. It can be seen from across Seville and is a stunning building patterened with brick trelliswork and arched windows and niches. It is generally thought to be one of the most beautiful and important Islamic monuments. The Archivos de las Indias is a huge storehouse which holds the archives of the Spanish Empire including the log of Christopher Columbus. The Alcazar was home to the rulers of Seville from Roman times. It was enlarged by al-Mu'tadid (famous for his cruelty) in order to house a harem of eight-hundred women. He decorated his terraces with flowers planted in the skulls of his enemies. The Alcazar was once a much larger complex and the remaining buildings date mostly from the Christian period when it was a popular residence for the Spanish kings following the Reconquest. The upper floors are still used by today's royal family, making it the oldest Royal palace of Europe that is still in use. Much of the palace was rebuilt under the rule of Pedro the Cruel and the result is some beautiful Mudejar architecture (a mix of Moorish and Christian styles). As well as Mudejar the Royal Alcazar contains Taifa, Almohad, Gothic, Renaissance, Baroque, Mannerist and Neo-Classical styles, and somehow it all works together very harmoniously! There are also beauiful gardens laid out in Moorish styles. Indeed one of the external walls with a walkway above the garden is beautifully decorated and one of the most stunning parts of the Alcazar. The Alcazar and gardens were used as the location for 'Dorne' in the filming of Game of Thrones. Seville's old Jewish Quarter encompasses these three buildings and spreads northwards from them in a maize of narrow streets with white-washed buildings and charming patios. 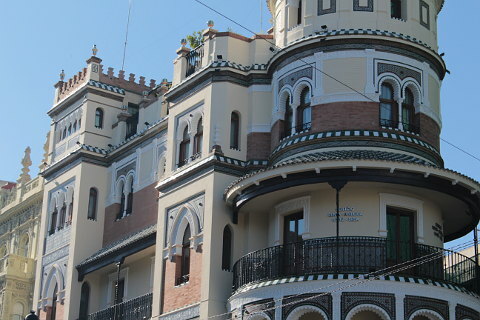 It is a lovely quarter and home to lots of old mansions including the Casa de Pilatos. This is often said to be a copy of the home of Pontius Pilate but is a charming mix of Mudejar, Gothic and Renaissance styles and has a wonderful patio. Another lovely patio is at the Baroque Hospicio de los Venerables and can be visited. The Hospicio also has superb Baroque frescoes. 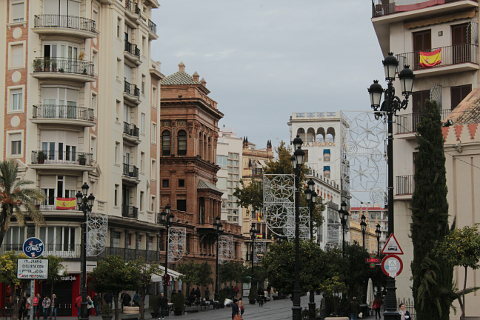 See our Barrio Santa Cruz page for more information and photos of this lovely quarter. On the riverside is the Torre del Oro, a twelve-sided tower which was once part of the Alcazar fortifications as a watchtower. It also had a defensive role with a chain strung across the river preventing boats sneaking up the river and into Seville. 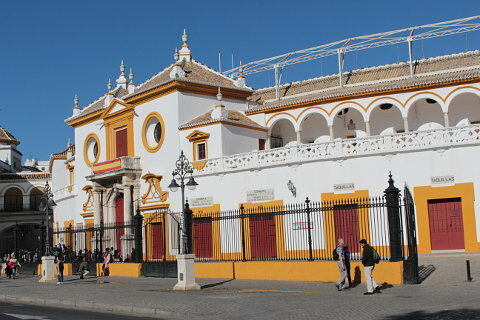 One of the main sights in the El Arenal district is the bright white bullring - the Plaza de Toros de la Maestranza. It was built in the 18th century and has a Baroque facade. See our El Arenal page for more information and photos of the El Arenal quarter. The magnificent Plaza de Espana was built in the Parque Maria Luisa for the 1929 Ibero-American Exhibition. Whilst relatively new compared to the key sights of Seville it is a wonderful building in a huge semi-circular shape with a large plaza in front of it edged with a decorative semi-circular pond that is crossed by rather Venitian-style bridges. 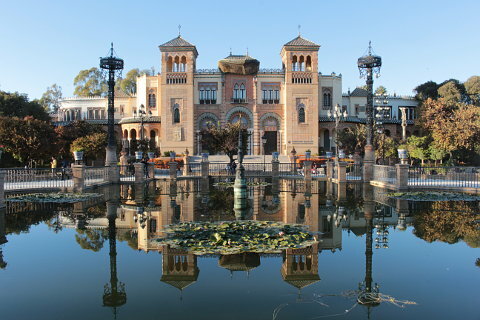 Elsewhere in the park is the Plaza de America and the Pabellon Mudejar which houses the Museo de Artes y Costmbres Populares, and the Pabellon de las Bellas Artes which houses the Museo Arqueologico. For more information about the Plaza de Espana and other places to visit in Seville visit our More Places to Visit in Seville article. 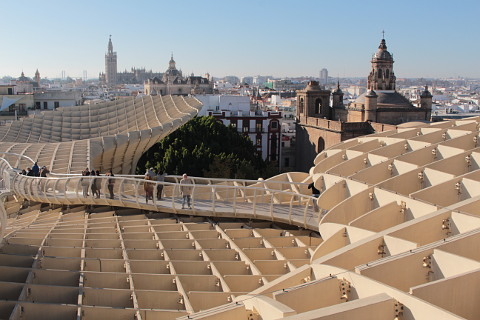 One of our favourite sights in Seville is a modern structure - the Metropol Parasol which is a huge and very beautiful wooden structure that looks like a series of mushrooms or parasols above the Plasa Encarnacion. On its roof are walkways and a restaurant with lovely views over Seville. The Museo de Murillo is the former home of the artist Murillo and is furnished with furniture and artwork of his era . The Museo de Bella Artes is one of Spain's best art galleries. It is housed in a former convent. The ruins of the Roman city of Italica are a short drive away from Seville. El Rocia to the west of Seville is considered to be one of Spain's most beautiful villages. It is especially worth visiting in May/June for the El Rocia pilgrimage when pilgrims from throughout Spain join the horse drawn caravans decorated especially for the pilgrimage. The lovely white village of Ronda which sits on top of a gorge makes for a lovely overnight trip from Seville.